I’ve been playing around with new ways to allow clients easy access to edit things like slideshows and callout boxes. When this client wants to update the titles, text, or links in the three callout boxes on the home page, they just have to edit the home page itself in the admin — no more clicking into theme options and searching through a multitude of tabs. The slideshow functionality here is provided by a light, fast plugin I built, so it’s not tied to the theme. I set up a template tag and a shortcode so it can be displayed in any theme. 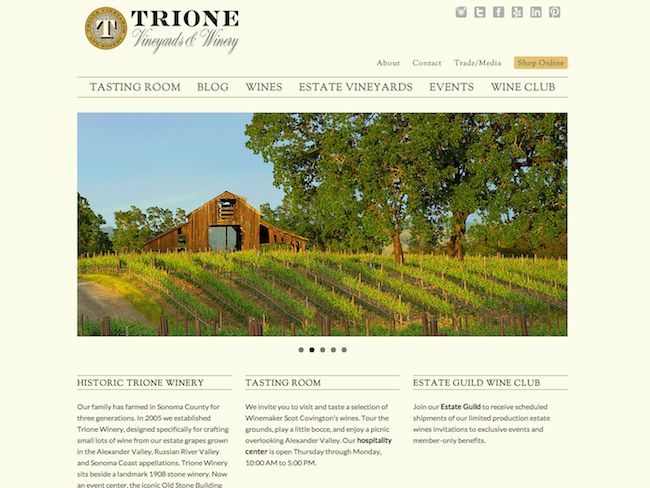 I designed and built the site in WordPress, and the multi-talented Melissa Crain of New Skin Media implemented my design for Trione’s Vin65 shopping cart.